Exclusive Discounts with Scotts Newsletter Sign-ups! Where do I use my Scotts voucher code? Copy your Scott's code from us and follow our link to the Scotts website. Browse for the products you want and add them to your basket. Once you’re finished shopping head to the secure checkout page. Here you can paste your copied code in the ‘Do you have an offer code?’ box and click ‘Apply Code’ to enjoy your discount. When you’re shopping for new, dapper men’s casual wear, you’d be hard-pressed to find a better selection of polos, jeans, chinos trousers, hoodies, track pants, tracksuits, football casuals and even onesies that the ones at Scotts. Keep the same stylish apparel from head to toe with their footwear collection of trainers, plimsoles, boots and shoes, and round out your outfit from their offering of accessories including wallets, hats, belts, ties and more. To save money on your clothing from Scott's head to NetVoucherCodes. Scotts work directly with us to provide discounts and deals on many of their products with a selection of great discount codes, e-vouchers, promotions and more. We keep all our discount codes for Scotts in one easy space, so you can grab a code quickly and easily to ensure you save money as soon as possible. For easy and hassle-free savings simply check out our Scotts deals page above and find the perfect discount that suits your booking. If you can't find a code or deal that suits you, don't worry new discount codes are added regularly so you are sure to grab some savings next time you buy. To stay in the loop and to never miss out on a bargain again, sign up to our newsletter for the first glimpse of new voucher codes and upcoming offers and receive email alerts when a discount code for Scotts comes along again. The Scotts sale features big price drops from huge brands such as Adidas Originals, Lacoste, Pretty Green, Nike, Emporio Armani, Boss and many more. Shop from categories such as clothing, footwear and accessories and find designer menswear at extremely low prices that you won't find elsewhere. Choose your size and colour and even browse sale collections like Gazelle, Superstar, Air Max, Roshe, Hamburg and more. Scotts also offer free standard UK delivery on orders over £50, plus free delivery to store on all orders, and a 28 day return period if you’re not totally happy - which, again, is free to store. And, you can also find plenty of money saving voucher codes on our page to grab additional savings on your sale items at Scotts. Scotts stock hundreds of menswear jackets and coats including parkas, duffle coats, Harringtons and light-weight jackets for all weather conditions from top brands like Pretty Green, Fred Perry, MA.STRUM, EA7 and more. Whether it's a bubble coat, padded coat, parka or waterproof you can find it at Scotts in a variety of sizes and colours from huge brands that offer nothing but big name labels and the ultimate quality. 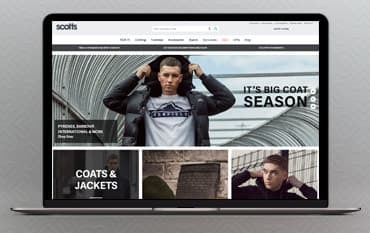 You'll find tonnes of reductions on coats and jackets at Scotts in the sale section and you can also save money by using our voucher codes and deals in conjunction with your order at Scotts. Scotts Menswear are proud to call themselves the Brand Authority when it comes to smart yet casual men’s clothing, and as official licensed stockists of the brightest names in men’s fashion, it’s easy to see how they’ve earned that title. Amongst the designer labels on offer you’ll find genuine authentic adidas Originals, Fred Perry, Pretty Green, Nike, BOSS, Emporio Armani and much more. Discover shoes, coats and jackets and a great sale section as well as money saving Scotts voucher codes on our deals page below.